For example, in 2017 Toyota showcased a self-driving concept car at the Consumer Electronics Show. It features an AI system named Yui that reads your emotions and can learn about your preferences over time. The car is nowhere close to being manufactured for retail, but it serves as scaffolding to build the future of the transportation industry using bleeding edge technologies. The Future Market brainstorms ideas for food products that illuminate how food is a means to improve the food system. To a large extent, this mentality is already reflected in the natural products industry, with brands such as Dr. Bronner’s, Patagonia Provisions, Maple Hill Creamery and EPIC using ingredients in their products as tools to mitigate climate change and spark social movements by nourishing the soil. In EPIC’s recently published Impact Journal, for instance, the company says that in 2017 they converted 620 acres of Monsanto-sprayed farmland to grassland (the brand’s goal is to convert 1 million acres). That’s tangible change to get excited about. Similarly, these six new concept products conceived by The Future Market are designed to inspire, motivate and provide a framework for thinking about how finished consumer goods can play a role in shaping our—and the earth’s—future. Find renderings, descriptions and my takeaway of each product below. For an added bit of fun, I’ve ranked each product by its “cool factor,” scored in none other than … number of cool cats. Because, cats. On a 1 to 10 scale, cool cats measure how likely it is for the concept product to succeed in the market, the challenges to making it happen and whether the product can inspire the next generation of food manufacturers. My takeaway: Originally invented to track Bitcoin, blockchain is a public digital ledger of transactions managed by a network rather than a central authority. As transparency continues to be a concern for all food—not just in meat—blockchain technology could be a solution to tracking exactly where food originated, and where it traveled to get to your plate. 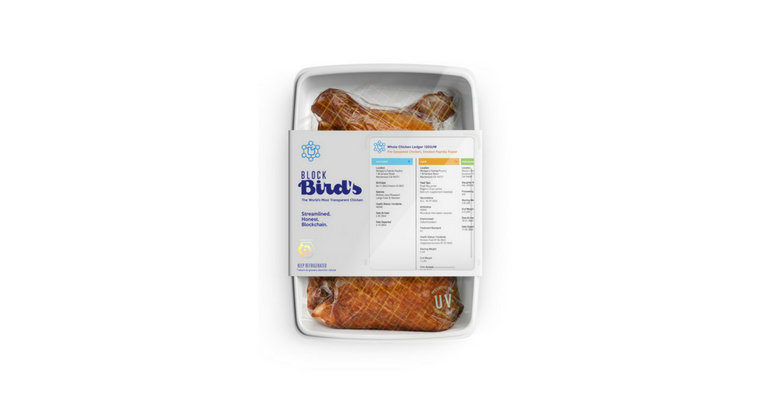 I love how this product concept includes hatchery, farm and processing information on the front of the package, which seems like it’s on a smart screen rather than printed on paper with ink, making for a more interactive shopper interface. The only thing missing: A third-party certifier that provides information about these three operations to make it easier for consumers to decide if it’s an ethical supplier. Is the farm a part of the Global Animal Partnership? Is it Certified Humane? Layering this information over blockchain would provide more nuanced product transparency. My takeaway: The insidious killing of sharks just for their fins is a leading reason why sharks are on the endangered species list. According to the Smithsonian Museum of Natural History, some shark populations have decreased by 60-70 percent due to human shark fisheries. In addition to assuaging the pressure on shark populations to supply shark fins, the presence of “cell ag” shark fin soup may work toward ending consumption entirely. Curious things occur in the market when formerly rare, expensive items are adulterated by the presence of synthetic versions—the real product becomes untrustworthy, and total sales fall. I first learned of this phenomenon from a company called Pembient that creates biofabricated rhino horns to end poaching. When Pembient announced its mission in 2015, news of the company’s work went viral—and astonishingly, rhino poaching rates stalled for the first time in a decade. “By the end of 2016, a ‘savings’ of over a thousand rhinos had accumulated, some of which might be attributable to frightened speculators leaving the market ahead of an impending influx of questionable horn carvings,” Pembient reported. 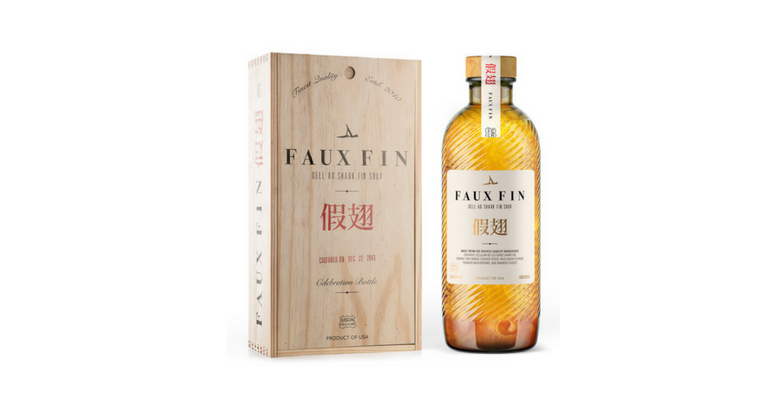 Faux Fin could be such an identical shark fin swap that the market for shark fin soup could disappear entirely. My takeaway: I mean, sure. 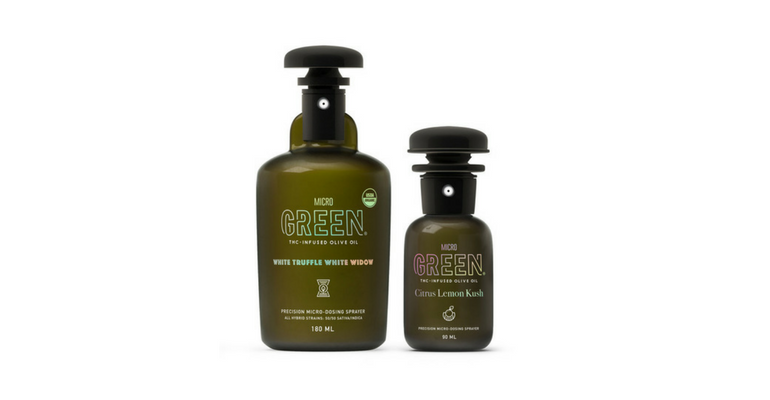 THC-infused flavored olive oil is a better way to catch a buzz than inhaling marijuana. And kudos for being organic. But I don’t see Micro Green providing notable environmental or social benefits. Although the idea of spritzing pizza with a white truffle-infused organic olive oil sounds pretty tasty, meh. Three cool cats. My takeaway: This is 10 cool cats! 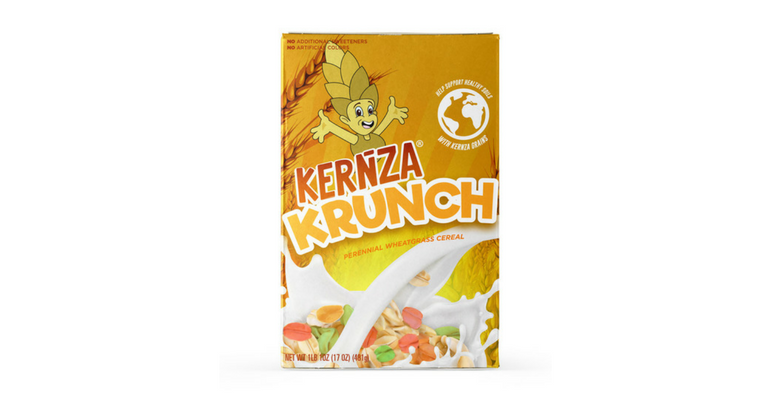 Kernza is a branded wheat strain developed by The Land Institute that has exciting potential to meaningfully capture carbon from the atmosphere and sequester it into the soil where it belongs. It’s a perennial grain, so farmers don’t have to replant every year or till their soil. Plus, Kernza’s root system can grow up to 10 feet in length—much longer than conventional wheat—which allows Kernza to require fewer water and fertilizer resources. I also love the idea to tint grains different colors (with natural ingredients such as beet juice, turmeric and red cabbage) to symbolize grain regional identity. It’s a way to spark respect for local markets in a nationally distributed product. My takeaway: I like this product! The design is reminiscent of a hipster-chic Polaroid camera, and I’d be delighted to house it on my kitchen counter. 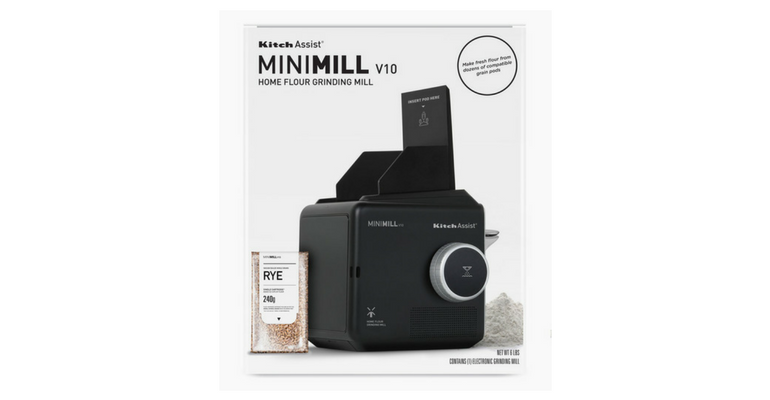 The Mini Mill would encourage consumers to incorporate more varied grains into their baking aside from conventional wheat, such as farro, millet, rye, sorghum, teff and more. As a bread baker, it would also make experimenting with grains easier. Why only five cool cats? The individually packaged pods of whole grains seems like unnecessary plastic packaging. 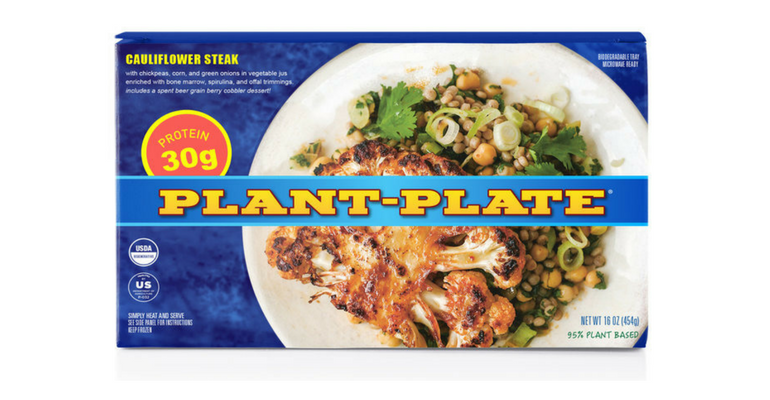 My takeaway: For this Hungry Man-style frozen product, The Future Market replaced the usual hefty slab of meat with a cauliflower steak, and used less-popular animal products such as bone marrow and offal to infuse the meal with flavor and added nutrition. It sure ain’t vegan. But this meal simultaneously promotes USDA Organic, convenient plant-based eating while also mitigating food waste. Very cool. Count ‘em—nine cool cats!